A little something Egg-stra Special! While today I am thinking about Spring, here in New Hampshire we’ve just had quite the snowstorm with 12 feet of snow, at least. It stuck to the trees, and is just a beautiful sight to behold. It’s almost too pretty to wish away just yet! That being said despite the snow we are plowing ahead and thinking Spring which really isn’t too far around the corner March 20th. So for our March Release we ARE thinking Spring and getting ready for the next holiday-Easter. Today I am previewing the Egg-stra Special template. They always say “which came first, the chicken or the egg?”, and in my case, the egg came before the products, so all my items used are older products!! Our design team will have samples using NEW products today. 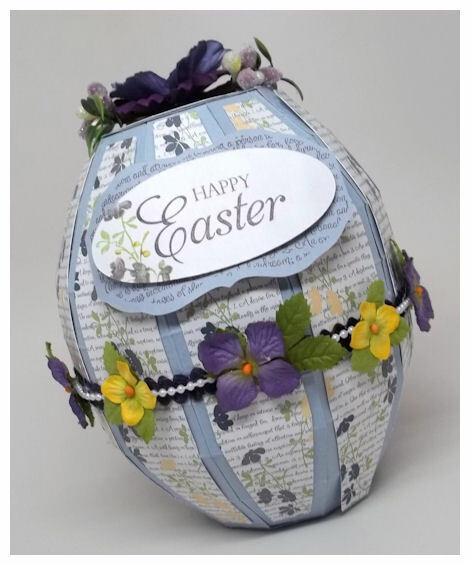 Looking for something a little “egg-stra” special to give this Easter? Do you love opening up those plastic eggs each Easter to see what tiny treasured treat is awaiting your discovery inside?! Ever wish those little eggs were BIGGER?! Look no further! 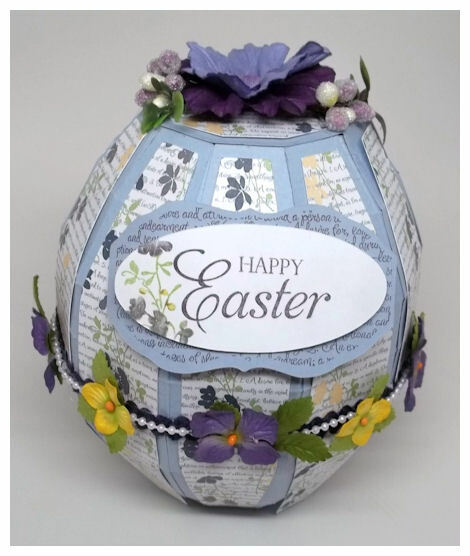 We have this amazing free-standing, 3 dimensional egg! 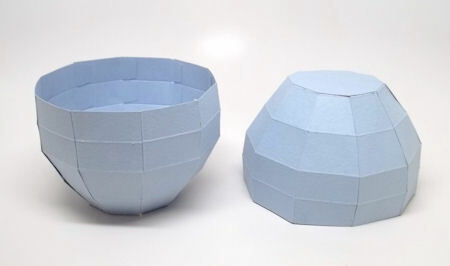 Well now you have your very own larger version made from cardstock! These are the two pieces (Top & Bottom) opened up so you can see just how the egg opens! I’m not yet sure what I am going to place in my egg, but I’m thinking a Lindt Chocolate bunny, and some truffles as filler. 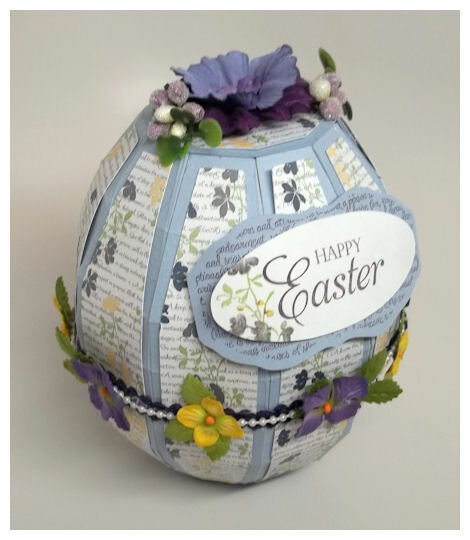 I used an amethyst cardstock for the egg, and then chose the stunning floral/text pattern from the Amethyst Sparkle © collection. I then cut my label using the Occasional Label © cut file, where I stamped on my text from the Occasional Labels © set. 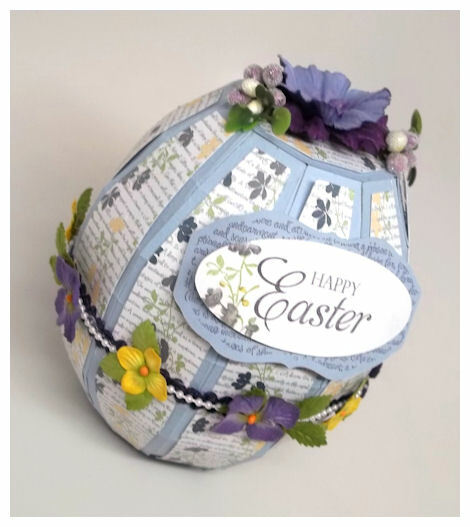 The Happy Easter sentiment is from our Sentimental Occasions © set which is fabulous, and works perfectly with the frames and cut file. The flowers on the side of my label matched my paper, and are from the Framed Elegance © set. I LOVE being able to mix and match everything to get one cohesive project. Around the edge I added some velvet ric rac in eggplant, and some pearls, with some pretty Prima flowers all along the edge. So may possibilities for this template. You can now create your own Easter or bird’s egg, or design this to look like a bunny, a chickie, a bird, owl, or anything that has a oval body! A little creativity will go a LONG way with this one. 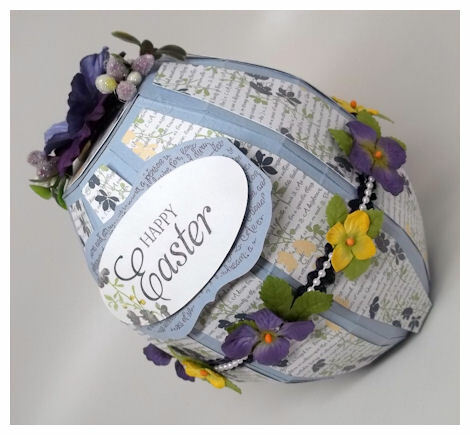 This template can be used to hold gifts for Easter, a new baby or mom to be, a plush toy, stuffed animal, candy, homemade treats of any kind, jars of jam, egg decorating kit/items, games, soup or dip mixes, baking items…to name a few. 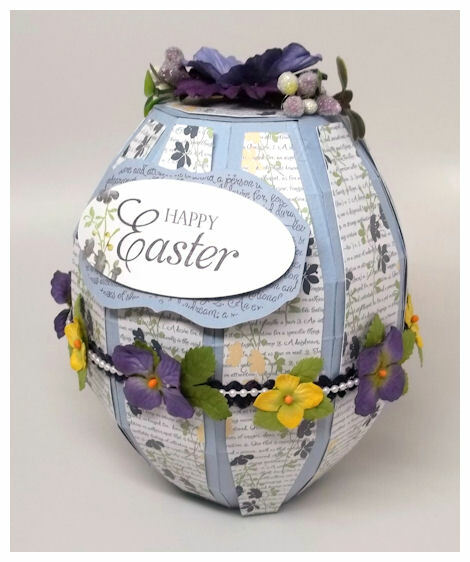 Whatever you decide to enclose in this fun template is sure to feel egg-stra special! Please view our Gallery for project samples, and alternative ways to use all our amazing coordinating products! Also if you haven’t already, you can follow us on Pinterest, as we have over 16 pinboards full of ideas, we are also on Facebook-so LIKE US there, and follow us on Twitter! We will return tomorrow for more great gift ideas previewing our latest products.